I try to bake something every week. I don't always achieve it. There are after-school snacks to take care of, the occasional pudding, and those empty-tummy moments that seem to accompany my life working from home. I've been trying to bake more healthily, with Ella's book, the Hemsley sisters and Sarah's lovely book. Yes there have been the ubiquitous date balls, raw food brownies, and oat-banana cookies in my kitchen, just as you've seen all over the blogosphere. And then this last weekend, I just needed a good old-fashioned fat & sugar blow-out. 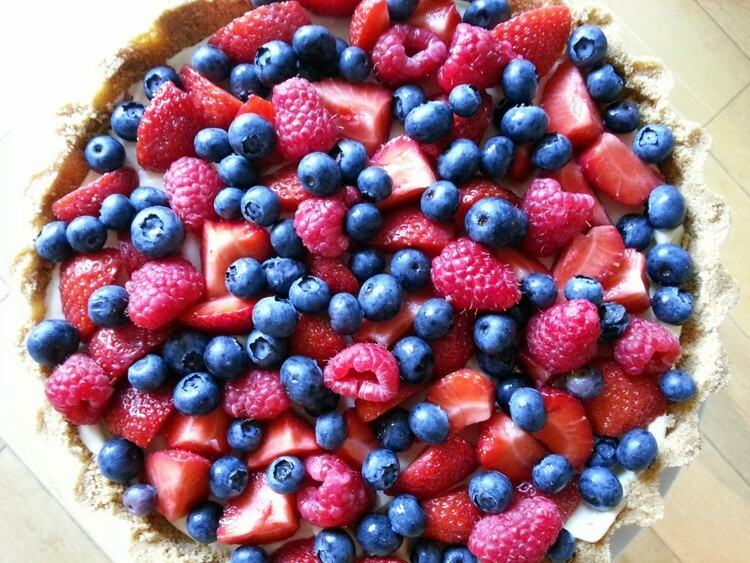 This is Nigella's No Fuss Fruit Tart. Brownie point one (pardon the pun): it was so easy to make. Brownie point two: no unusual ingredients. Brownie point three: no oven involved. Brownie point four: it's absolutely delicious. 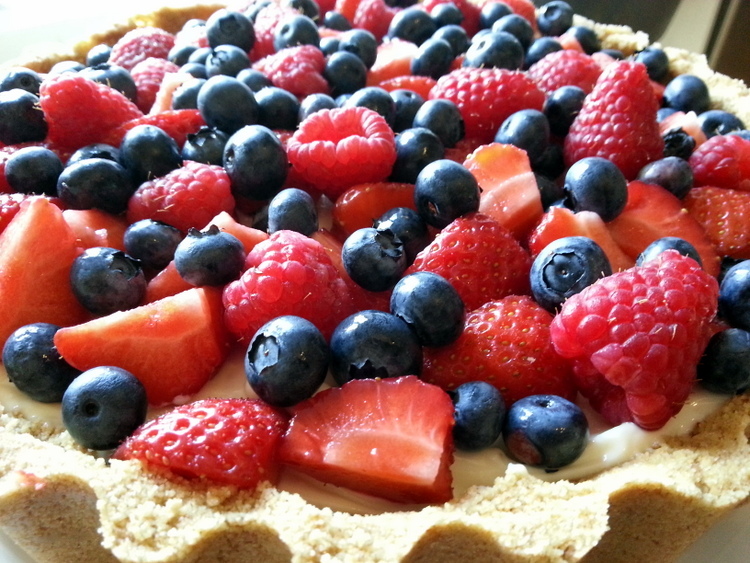 And those berries: just look at those rich red to blue hues. You can't help but want slice after slice. The down side is that I couldn't in good conscience give such a sugar/fat-fest to my young children twice a day. And my husband and eldest son are both on a pudding-free health kick (which means one slim slice only). And my very youngest Tiny One, who is the lone picky eater in a family of adventurous eaters (I can't even begin to tell you how draining it can be), didn't like it. Conclusion: make it for a dinner party, or a big family gathering, or friends for a barbecue. It's so easy, everyone will have a slice, and pretty much everyone will love it. Don't make it like I did, just for your family who mostly won't eat it. Otherwise you might end up eating about three-quarters of it all to yourself a week before going on holiday when you're supposed to be being good (swimming costume shame, blah blah). Consider my wrists slapped. I'm back to the raw health food. Once I've polished off the last slice that is. I have a good friend who makes scones at least once a week. I wish I could just knock them up without a moment's thought like she does! This recipe doesn't actually need cooking so I think it's a perfect one for more occasional cooks. Try it! Yum, yum, yum, yum. Raspberries were on sale this week, so I've been looking for an excuse. Thanks for linking with #TwinklyTuesday. Raspberries need no excuse Sadia! Thanks for your comment. Oh, it does look so good, though! Not helpful to me if I'm trying to be healthy..!